“This is humbling. It’s a long way from a private jet,” Michael Woodford shouts out as he charges across five lanes of traffic and into the underground at Euston Square. In a previous life as the boss of one of Japan‘s biggest companies, Woodford was used to being served champagne at 33,000ft as a stewardess put slippers on his feet. But that was a very different life again from the one Woodford was born into, in a “sink estate in Liverpool”. As well as having a difficult upbringing in a “shoebox”-sized home, Woodford was bullied for being both Jewish and Chinese – he is neither, but he went to the King David Jewish school and has a slightly oriental appearance from Tamil ancestry. While he always tried to stay grounded as he climbed the corporate ladder at Olympus over three decades, it’s tough, he says, to break ties with the luxury lifestyle. “I don’t like travelling economy on long-haul flights. All that pampering over the years has obviously got to me – so it’s always business class,” he says as he relaxes into the leather seats of the first-class carriage from Paddington to Oxford for the latest in a series of public speaking engagements. It’s not as if he can’t afford to be a little silly. Earlier this year he collected a £10m settlement over his dismissal for blowing the whistle on a £1bn fraud scandal at the endoscope and digital camera company. Some of his beliefs would go down well with Marx and Lenin. His kids won’t be getting any of the £10m. “If I’m struck down now, they won’t get a penny,” he says. “Rather than being posh little rich kids, they’re going to go out there and earn it on their own.” Edward, 19, and Isabel, 17, were sent to state grammar schools until he left for Tokyo, when Isabel was sent to a private boarding school – “she would have had to be sedated and handcuffed to go [to Tokyo]” – where, Woodford says, she’s educating her classmates. His money will go to charity, predominantly those campaigning for human rights, such as Clive Stafford-Smith’s Reprieve, and road safety foundations. Woodford says Japan’s obsession with politeness and social niceties is partly to blame for the country’s fall from the top of the global power tree and the fraud that almost destroyed the 93-year-old Japanese electronics company. “There is a disaster in Japan because of these social characteristics – the deference, not being able to question people in authority,” he says. 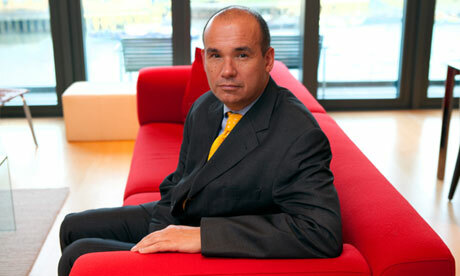 It was this attitude, he continues, that almost allowed Olympus’s previous bosses to cover up more than £1bn of fraud. He first got wind of the claims just weeks after taking over as chief executive – the first foreigner, or gaijin, to run the company, and only the fourth at any major Japanese company – when a friend emailed him a translation of “amazingly detailed” claims published in Facta, a local magazine with a campaigning remit similar to Private Eye. “When I got to the office I expected everyone to be talking about it. But no one mentioned it.” By lunchtime he summoned two of his most trusted colleagues and ask them if they had read it. They had, but said that Tsuyoshi Kikukawa, Olympus’s previous CEO and then chairman, had “told them not to tell me”. Eventually Woodford demanded a meeting with Kikukawa and Hisashi Mori, then deputy president and “Kikukawa’s permanent sidekick”. The table for the lunchtime meeting was set out with the “most wonderful selection of sushi, but in front of my place was a tuna sandwich”, Woodford, a committed sushi fan, told students at Saïd business school in Oxford later that evening. “It wasn’t just any tuna sandwich – it was a tuna sandwich that would have made British Rail in 1981 proud. It was that manky. The tuna sandwich was to tell me my place in life. Although Woodford tried to embarrass Mori into talking to him by following him into the urinals and shouting at him eyeball to eyeball, Mori and Kikukawa refused to explain why Olympus had spent almost £1bn buying three “Mickey Mouse” companies and paid $687m for mergers and acquisitions (M&A) advice on the deal. “It was the largest payment ever made for M&A advice in the history of capitalism by a factor of three,” Woodford says. Forensic accountants traced the money to London, from where it “went to the Cayman Islands and disappeared”.